STAY HOME. Let the streets be EMPTY and SILENT. Let the rabble rousers have no one to quarrel with, nothing to rant and rail about. Take the wind out of their sails. Let them walk away empty-handed, having expended funds, having geared up for NOTHING! I had been hoping that residents of Ferguson Missouri, the protesters and people coming from out of state to join the protest would stay home. Rather than take to the streets and be subject to the jurisdiction of the Police, Mayor and Governor, stay inside and have BALLOT Initiatives and BALLOT Proposition parties. Write, create, upgrade and/eradicate LAWS so that those remaining laws SERVE, PROTECT and HONOR the citizens who would be governed by them. Gil Scott-Heron sang that “the revolution will not be televised”. Marching is televised. It telegraphs your every move. Don’t you have to get a PERMIT? What’s revolutionary about that? Don’t you have to inform the local municipality of your intent? That’s not revolutionary. At the end of the day, what will your marching protest have accomplished? Michael Brown is still dead. The LAWS which helped that happen are still in force, ensuring that same thing can happen again and again. And due to marching some people may now get police records because they are arrested for protesting! What was/is your intention of the protest march? When will you accomplish those goals? I cannot help but be struck by the memories of seeing all those people and some generations of families at the 50 year anniversary of Martin Luther King’s “I Have A Dream” speech. As a people we’re pretty much still in the same boat. And YES, there has been movement and progress. We canuse the same toilets, sit anywhere on the bus, at a restaurant, etc. Yet I cannot help thinking how much more, how far we might have come and be today, IF, I/we had TRULY understood that THIS COUNTRY IS RUN BY LAW. The laws are what we are governed by. And IF, “A Change Is Gonna’ Come” changing and creating LAWS has that happen. So I say to the people of Ferguson Missouri stay home. Have some law, initiative and proposition writing parties. Our parents used to have Quarter, Card, Poker, Bid Whist and Bridge parties. Use that same format of gathering together for a common interest. BE SMART. STAY HOME. Create and change the LAWS. Remove from office those who do not have your interest at heart and elect people who represent YOU and will carry out your new laws, propositions and initiatives. Finally, staying home, even for 24-hours, not contributing as consumers may cause a ripple in the economy. Speak to the “powers that be” in the language they understand. See the image here and over to the right? That’s how I get content. 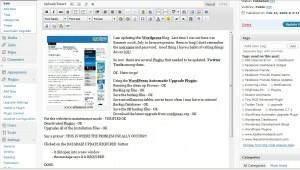 WordPress Automatic Blog Posting Plugin. A PLUGIN! I’ve owned it for a year and I LOVE IT! It’s like a Popeil product: I can, “Set-it-and-Forget-it”. I thought I had written about this Plug-in when I first purchased it. I searched back through my WP posts and could only find a COMPLAINT about things it was initially posting to my other sites (once I changed the CATEGORY setting it worked like a charm). Well, I should’ve come back here and PRAISED it. because I actually DID write something, Feb 25, 2009 at 10:38pm, however it was stored on my laptop!!! They said it would only take 3 minutes to install – I was able to install the product in 2 minutes WITH CONTENT. Make sure you check the page to see your content! I love this Finally a product that delivers what it says AND I haven’t even begun to use the videos to tweak yet! After reading it I realize I didn’t POST because I like to make sure something WORKS as it says before I recommend it and I had only installed it, yet we were off to a good start. Now that I’ve had the product for a year since that initial write-up, I’ve come to so APPRECIATE it. 260 possible titles PER DAY. You can post 1-10 articles per day. Once you purchase it – it’s YOURS to use on ALL OF YOUR SITES! Customer service is quick. I noticed early February 2010 that no articles had posted on ANY of my sites since January 25th 2010. I sent an e-mail to the provider, Peomedia, along with my purchase data. I was informed I’d missed an e-mail about the upgrade. That e-mail also included the link to the upgrade. I reset the Category. Updated the Settings. Used the Fetch button and since that day my site has been filled with pertinent data which people have been commenting about! Whether you have one or several sites, this is a GREAT investment. Well, I do have to give myself credit. I did upgrade two of my other sites a couple of weeks ago. I chose the Please Update Now which gave me the option of Upgrade Automatically or Download 2.9.2. I’m proud to say, I chose Upgrade Automatically. I had been using the WP Automatic Upgrade Plug-in which steps one through the entire 5 steps provided in the wordpress upgrade instructions process from backing up the database and files to the final reactivating all the plugins. I’ve been a bit cautious clicking that Upgrade Automatically button in the past. I’ve had some doozy experiences with it and upgrading WordPress which I’ve mentioned here, hence the title Adventures with WordPress. I’m pleased to say that once pressed, I sat back and was thrilled when the response returned was Upgraded Successful. In my humble opinion, TOKBOX is what SKYPE hopes to be when it grows up! Why? If I begin the call (i.e. hosting in SKYPE) and I get knocked offline FOR WHATEVER REASON, the CALL CONTINUES!! Someone in the conference told me they could almost access it via their PDA! I’m sure there are other features which are just as fabulous. This is MORE than enough for me right now. The REALLY COOL about the VideoChat Conference is that part of our group was in a hotel in Atlanta – one window of the VideoChat was devoted to THEM!!!! Check TOKBOX out at http://www.tokbox.com and @Tokbox Tell them Llenar sent you! I decided to check out the type of articles I was getting from the new Automatic Blog Posting WordPress Plugin software on my It’s All An Inside Job WP Blogsite which is pretty much about Self-Help. Good thing I did. Lo’ and behold there on the front page was a 10 paragraph article entitled “How Not to Hit On A Stripper – Learn What Makes A Stripper Tick” by Mark Taylor. So now I’ve tweaked the software and changed the ARTICLESBASE CATEGORY from the main category of Self-Improvement to one of it’s sub-categories, more specifically, Self-Help which gave me what I consider a more appropriate article: Stress Reduction through Gratitude much, much better. That snafu had me thinking I’d better check the other sites as well. So off I go to check The Commando Coach and there wasn’t a new post. The one from yesterday was still there. I don’t like that. I was thinking that they would all change at about the same time. No such luck. That means I’ll have to go check more than once a day, rather I cannot check all of them at the same time. The only good thing about that is I don’t have to check the ones I’ve already seen. So that’s OK. 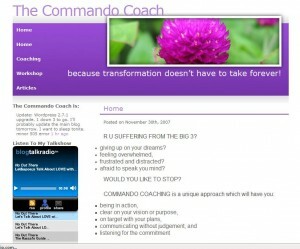 So for the Commando Coach site, I logged in, and used the Fetch Now! button and got a good COACHING article entitled: Is There Soul in Your Goals? Set Goals That Compel You. All Right! I haven’t used this for my main site yet. Haven’t figured out if I should have articles there which might interfere with the Talkshow articles. And for this site -it’s now set up correctly since the Fish story and the Yeast Symptoms got deleted! I am updating this WordPress blog. Last time I was out here was Summer 2008, July to be more precise. Been so long I don’t remember the username and password. Good thing I have a habit of writing things down! LOL! So now there are several Plugins that needed to be updated, Twitter Tools among them. Save miscellaneous tables, never know when i may have to restore! Say a prayer: THIS IS WHERE THE PROBLEM USUALLY OCCURS!!! – I AM not clicking on the CONTINUE BUTTON. I’m going BACK to the previous window to REACTIVATE THE PLUGINS . OOPS! Got a message which said I didn’t do the CLEANUP so click that. Seems I shoud have pressed the CONTINUE button! I’m returned to the DASHBOARD? I think? This doesn’t look like MY DASHBOARD. Where are all my STUFF? Where’s my Recent Comments? Incoming Links? WordPress Development Blogs? Plugins? Facebook Friends Status Updates? Facebook Friends Notifications? Facebook Friends Posted Items? Let me activate the these last 4 Plugins. YIKES! Tiny MCE Advanced Plugin gave me a 505 Internal Server Error – WHEW! Website is still OK. Glory Hallelujah!! OK. This isn’t as bad as the last 2 upgrades which I wrote about here. 1 down 3 to go. Why not? I’m feeling LUCKY! Stay tuned! The HTML looks OK – alignright, alignleft – however, the text isn’t wrapping! Uggggggggh! I HATE UPDATES!! Oh Groan, there are so many Plugins to update. 1-2- Whaaa? – 12 in all. Yawn. What if I just go ahead and do the update? Well, I’ll do it that way this time and see what happens. Thank GOODNESS the WordPress Automatic Upgrade Plugin doesn’t need updating. WOW! I’m almost done! I can’t believe it. This time I’m going to press the CONTINUE button on the WordPress Database Upgrade Screen Wish me luck! Here goes. . . Guess it doesn’t matter. I got the same error last time: You have not cleaned up the files from last upgrade. Please Click Here to cleanup the files, and disable this nag. Ok, so I’m doing that. Now I get the Congratulations!!! Your WordPress version is already up to date. I’m back at the Dashboard, however, let me go back and see what that other window said. It tells me to CLICK NEXT so I do and VOILA! I got an entire log of the previous activity along with a notice that those 12 plugins are awaiting. Congratulations!!! Your WordPresss installation has been upgraded. Please download your backup files if you have not done it. Ok, I’m feeling kinda’ tired here – oh yeah, my late night vitamins Cal-Mag are kicking in – so I’m gonna’ press the UPGRADE ALL Plugins Button. That’s caused me problems in the past, yet I’m feeling kinda’ lucky tonight so I’m gonna’ GO FOR IT! Well, half of the Plugins are installed and the Dashboard has been partially populated. Here goes for the next 6. Internal Server Error AGAIN. Back to the ADMIN page. No more messages about Plugins however, I still show 6 from the Plugins directory Tiny MCE Advanced – which didn’t cause an Internal Server Error this time. Twitter Tools 1.6b1, Wordbook, Facebook Dashboard Widget, Wordbook and PingPress.fm are loaded safely and the blog looks OK.
Well, this is the last one before I sleep. Yawn. Since it was so easy the last time. Let me tell you – way different from WordPress 2.0’s! Weird. No notices about Plugins, however, I see that 11 of them need updating. Well, I learned from the last update that I can just do the process and come back and update Plugins later. So here we go. I’m tired now. Oh well, I can’t argue with a machine. Let me do the clean up! And WOW! The entire Update ran smoothly. I think I got the procedure down so that I can do the main website in the morning. Why in the morning and not at night? Because my Tech Guru will be awake then in case I crash my website!!! Let’s see: so now, at the end of the process when it sends me to the other window to do the Database Update Required thing – stay in that window until it comes back with the CONGRATULATIONS already up to date. And then go back to the other window and follow that through to completion. That’s where I get the log. I got one fail and a couple of Plugins that I no longer use errors. 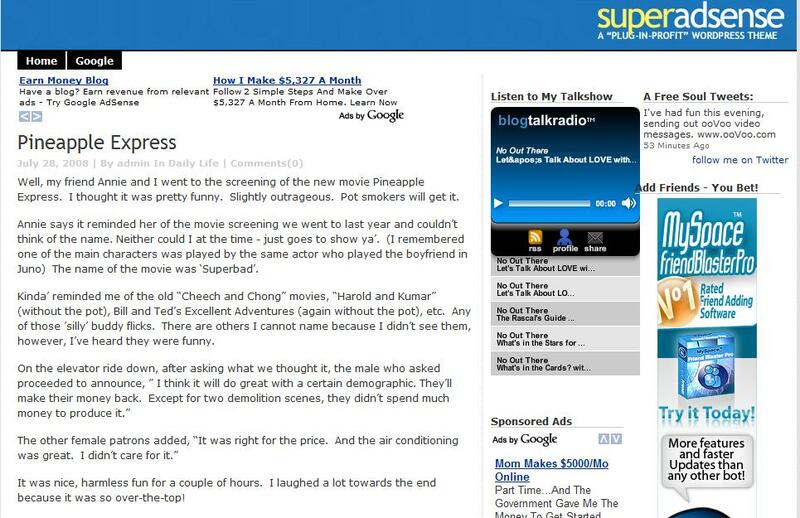 Well, my friend Annie and I went to the screening of the new movie Pineapple Express. I thought it was pretty funny. Slightly outrageous. Pot smokers will get it. Annie says it reminded her of the movie screening we went to last year and couldn’t think of the name. Neither could I at the time – just goes to show ya’. (I remembered one of the main characters was played by the same actor who played the boyfriend in Juno) The name of the movie was ‘Superbad’. Kinda’ reminded me of the old “Cheech and Chong” movies, “Harold and Kumar” (without the pot), Bill and Ted’s Excellent Adventures (again without the pot), etc. Any of those ‘silly’ buddy flicks. There are others I cannot name because I didn’t see them, however, I’ve heard they were funny. It was nice, harmless fun for a couple of hours. I laughed a lot towards the end because it was so over-the-top! Annie and I both want to know one thing: How did Dale know where to go to save Saul? Maybe our heads were ‘in the clouds’ when that was revealed in the plot(?). Well, after the earlier resolution to the WordPress 2.6 update login loop issue I felt pretty confident that if a problem arose, I could handle it with the wp-admin reload fix. Silly me. I decided to update a less active site. Good choice. I experienced the SAME issue and this time, the wp-admin fix DID NOT WORK. I went to the WordPress.org site’s Forum and found several other people are having various issues with the 2.6 update. I looked under Installation – there was a topic TWO fixes for 2.6 login problems. A user there had lain out a particular set of parameters to use one of the fixes he suggested. My setup happened to match those criteria – so I followed the instructions and had success. If you’re having problems with updating to 2.6, I suggest you go to the FORUM and read to determine your own situation and procedure to follow. I’m not sure if it’s the Automatic Upgrade plugin or something with WordPress 2.6 itself. There was an upgrade for the Automatic Upgrade this afternoon from 1.2.0.1 to 1.2.1. When I began the other post, I didn’t anticipate a part 2 so I’m calling this the sequel because I intend it be OVER in a few minutes!! Ok so here I go to upgrade my WordPress blog to version 2.6 using the WordPress Automatic Upgrade Plugin version 1.2.0.2 . . . I’ll be back. So I left clicked Plugins on the Dashboard page, Scroll down, locate the plugin, left click on the little text which reads WordPress Automatic Upgrade and immediately get 2 error messages telling me something about the process has already been started. CRAP! Must be something from last night. I repeat that process. Yeah, I know, I do that when I cannot believe what previously happened which SHOULD not be happening – at least in my world! I decide to reinstall the WordPress Automatic Upgrade Plugin – don’t ask my why – when I notice IT’S INACTIVE!!! Clearly residue from last night because that’s the last thing I remember doing before I was locked out of my websites. So I ACTIVATE the plugin. On the Dashboard there are TWO messages: Click Here to Automatically Upgrade WordPress to latest Version, followed by WordPress 2.6 is available! Please update now. I remember when the WordPress Automatic Upgrade plugin is activated that message is displayed in the Dashboard. I LOVE PLUGINS!!! Next Task –> tells me what is about to happen when I press Click Here in Please CLICK HERE to go to the next task. I continue following the prompts and it says I’ve been updated and everything is FINE. My database may need to be UPDATED Click Here and if the message says to update then do that AND RETURN TO THIS PAGE. I press Click Here. It says I may have to wait a few moments for the database to be updated then it says COMPLETE and Click Here. I do. HOLY CRAP! What’s this? I cannot get back into my website! !A@#$%^%^ What the heck? @**@# After all this!!! Ok. Let me try a few things before I call on the calvalry. And what happens? It says looking for www.afreesoul.com and then says DONE and I’m still on the Login page. Even if I put in www.afreesoul.com/wp-admin I still get the LOGIN page and nothing more happens. Another Loop!!! I’ve done what I know to do, let me call my friend, Internet Marketing Coach and WordPress mentor, Jonn. He tells me, “I was going to let you know, I had a problem with 2.6 – but is was MY problem not theirs.” “Yeah, right”, I smirk. “Ok”, he says, “well download WordPress 2.6” I begin to groan. He continues, “Unzip it. Use your FTP program and just reload the admin files. If that doesn’t work – reload the entire WordPress 2.6.” I begin to complain, “Jonn, you KNOW I hate that.” He retorts, “Well what do you want to do? You called asking for my help. I’m helping you.” I repeat his instructions. We hang up. I grudgingly follow his instructions while muttering in my mind because I abhor updating WordPress manually. I create a folder. Download the zip file into it. Create a sub-folder. Unzip into that (so I can go back and delete this stuff off my computer). I FORGOT I didn’t have to unzip the ENTIRE 647 files. So even though I’ve unzipped the entire file, I only FTP the wp-admin folder using Overwrite If New. I close the FTP program. Go back to the login screen and I”m in!!! I’M IN!!! I reopen this post. First hing I see directly underneath ‘Draft Saved at . . . is Word count 451. Hmmm, nice feature. Ok, I’m likin’ it. Now let me go and ACTIVATE my plugins. MAN-OH-MAN-OH-MAN-OH-MAN ONLY ONE PLUGIN IS ACTIVATED – WordPress Automatic Upgrade!!! I’ve got about 30 plugin’s here and I don’t know which ones I had activated for sure on this blog!!! Brother! So, when I login today, I get a message which reads: WordPress 2.6 is available! Please update now. Didn’t I just upgrade to 2.5.1? That would be a YES! When I go to my Plugins page, I notice there’s an UPDATE for WordPress Automatic Upgrade. So I Update that. It’s easy now because awhile back I installed some plugin which notifies me when there are Updates to ANY Plugin I have. I can either update them ALL at one once or individually at my leisure. As I’m writing this – suddenly I can no longer access this website, nor any of my other 3!!! I call GoDaddy. After asking me for account verification info – which I don’t remember off the top of my head, the tech tells me he can see my websites fine. I say, “I can’t”. Then he asks, “Is SBC Global your Service Provider?” I reply, “Um, I’m with Ameritech. Yeah, they’re part of that system.” He says, “There’s a problem with the router to our system. That’s a known condition right now.” Whew, I breath a sigh of relief. It’s not anything I did!!! “How long before I can get back into my website?”, I inquire. “Probably in a couple of hours. They’re working on it now”. he replies. I tell him I’m going to call it a night.